Safely Convert from NTFS to FAT32 or from FAT32 to NTFS without Losing Data. As it’s name suggests, NTFS to FAT32 Wizard is a NTFS to FAT32 converter which performs converting from NTFS to FAT32 in a fast and reliable way without any data loss. 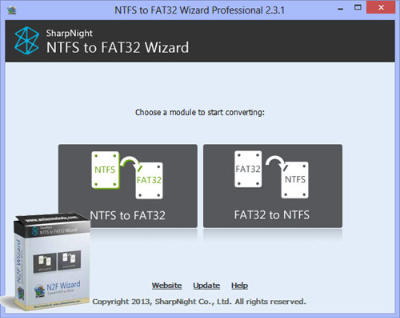 In any case you want to switch back from FAT/FAT32 to NTFS, NTFS to FAT32 Wizard provides an easy way of doing it. You can convert back and forth anytime you want.